We had record temperatures yesterday and, even though my legs are as white as the melting snow, I couldn’t resist pulling out some of my new spring purchases to celebrate the warm weather! As I mentioned, our kids are on winter break this week, so we spent some time outdoors as a family and then went to one of our favorite antique shops to hunt for treasures (I scored some great vintage books & an iron trivet). This outfit is a combination of four of my spring essentials – a cotton shirt, casual day skirt, comfortable wedges & a carry-all tote. 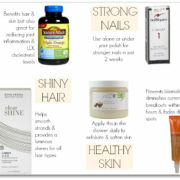 These are staples that I know I will reach for over and over again & that I can style many different ways. I’m a sucker for stripes and the lace-up detail on this top gives it a cool modern feel – it does run a bit small so you may want to order one size up. This skirt is so flattering because it hits right at the smallest part of your waist and has a slightly a-line shape, so it isn’t as restrictive as a traditional denim skirt. I also love that it’s a classic dark wash so it is easy to dress up or down and the buttons are functional only half of the way (it’s sewn shut from below the 4th button), which is nice because you don’t have to worry about flashing anyone when you sit down! These wedges are my favorites from last year because they’re so lightweight & comfortable – I wore them all summer long & was so excited to pull them out again. They go with everything from dresses to denim and they’re on sale now (also in 3 other colors).